Mladá Boleslav, 20 March 2019 – ŠKODA delivered a total of 1,253,700 vehicles to customers in 2018, setting a new sales record for the fifth year in a row. ŠKODA is entering the era of E-Mobility in 2019, starting with the all-electric version of the CITIGO and the SUPERB with plug-in hybrid drive. ŠKODA is also rigorously pressing ahead with the implementation of its 2025 Strategy in terms of digitalisation. ŠKODA AUTO DigiLab is represented with branches in Prague and the IT hotspot of Israel, and has already signed many partnerships with start-ups. As part of the INDIA 2.0 project, the company has also assumed responsibility for Volkswagen Group’s model campaign in the Indian market. 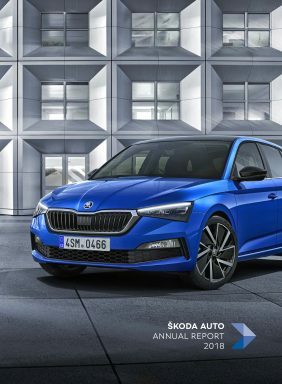 ŠKODA AUTO continues its global success story: in 2018 the carmaker set a new sales record for the fifth time in a row. Deliveries to customers rose by 4.4% last year to 1,253,700 vehicles. The company recorded sales growth in Europe (+4.9%) as well as in the growth markets of China (+4.9%) and Russia (+30.7%). 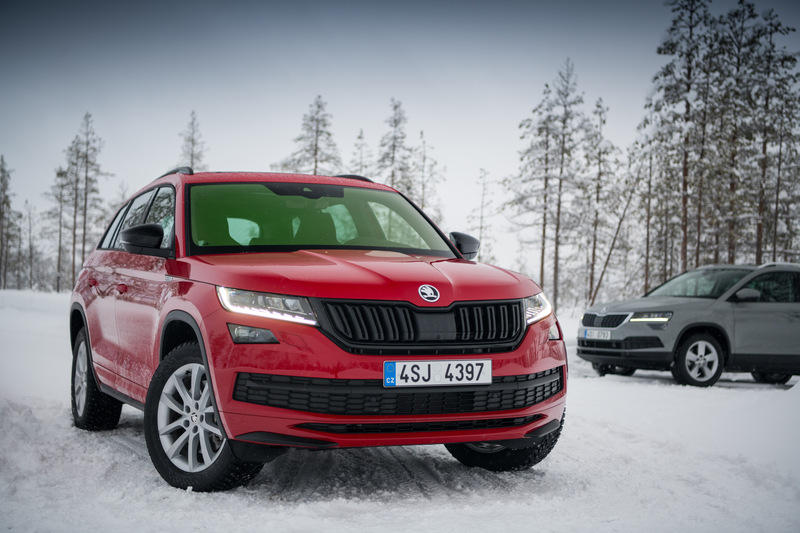 The KODIAQ and KAROQ SUV models continue to be important drivers of growth and the ŠKODA OCTAVIA remains the brand’s bestseller. With 341,000 deliveries to customers, China continues to be the brand’s most important single market. In Germany, Europe’s largest and ŠKODA’s second largest single market, the brand delivered 176,600 vehicles – a year-on-year increase of 1.9%. ŠKODA delivered 93,600 vehicles in its home country of the Czech Republic. 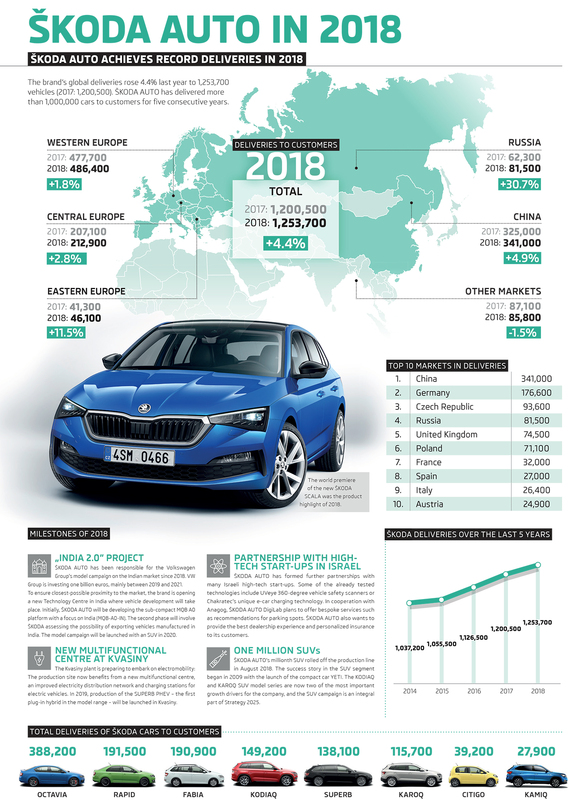 The UK (74,500 vehicles), Poland (71,100), France (32,000), Spain (27,000), Italy (26,400) and Austria (24,900) round off ŠKODA’s top ten sales markets. The heart of the car manufacturer’s operations beats in the Czech Republic. The 886,100 vehicles that left the production lines at the Czech production sites in 2018 represent an increase of 3.3% compared to the previous year and thus a new production record. The Group’s decision to build the Volkswagen Passat family at the ŠKODA Kvasiny plant from 2023 – alongside the ŠKODA SUPERB and KODIAQ – is proof of Volkswagen Group’s confidence in the Czech production sites and their quality standards. In 2019, ŠKODA is entering the era of eMobility. 124 years after the company was founded, ŠKODA is launching its first electrified production model – the SUPERB PHEV. The brand’s flagship with plug-in hybrid drive will roll off the production line in Kvasiny. ŠKODA is broadening its range in the same year to include an all-electric car – the e-CITIGO. The first production models based on the MEB modular electric car platform will follow in 2020, including the production version of the ŠKODA VISION iV concept study. By 2022, ŠKODA will have introduced over 30 new models, more than ten of which will be electric. In addition to electric cars, the Mladá Boleslav plant will also be producing electric components for the plug-in hybrid models of several Volkswagen Group brands from 2019. ŠKODA is pressing ahead with accessing new markets. Since last year, the brand has also been active in Singapore, meaning the company is now represented in 103 markets. ŠKODA employs more than 36,000 people worldwide. The car manufacturer’s internationalisation is one of the cornerstones of its 2025 Strategy. Additional strategic areas of activity include eMobility, autonomous driving, connectivity and digitalisation. ŠKODA AUTO intends to increase its global vehicle sales by effectively implementing these topics. It will also open up new lines of business involving digital mobility services to broaden the basis for further growth. The transformation of mobility and digital change are of greatest strategic importance. ŠKODA is working hard to digitalise its products and processes. This covers all areas of the company, from procurement to training, finance, staff recruitment and sales. The focus will also be on the Technical Development, Production and Logistics departments as well as, of course, the finished products for the end customer. In Logistics and Production, the company is increasingly incorporating Industry 4.0 technologies, carrying out large field tests on fully autonomous drones that are monitoring load carriers at ŠKODA’s Czech plants. Robots are also working side by side with their human counterparts and intelligently facilitating their work. Using predictive maintenance, machines recognise their own needs for service or repair, thus reducing the risk of any damage or downtime. And when packaging Complete Knock Down (CKD) kits, augmented reality projections can show where and how to stack the parts on the load carrier. Within the Group, ŠKODA is a pioneer in introducing the new MIB 3 modular infotainment matrix. For the brand’s customers, this means having access to the best connectivity solutions in their vehicles and benefitting from convenient over-the-air updates in all new ŠKODA models. In cooperation with cities such as Prague, ŠKODA is committed to sustainable urban mobility concepts. The aim is to optimise the flow of traffic and intelligently link intermodal transport. This increases people’s safety and comfort whilst reducing the environmental impact. Alongside these initiatives, ŠKODA is developing a variety of mobility and vehicle-on-demand solutions. The private peer-to-peer car-sharing app HoppyGo, the student car-sharing platform Uniqway and the mobility solution for people requiring special assistance CareDriver were created at ŠKODA AUTO DigiLab. ŠKODA is currently testing a pioneering delivery solution for the ‘last mile’, where parcels are delivered directly to the boot of customers’ cars – digitally secured and with maximum convenience for the drivers. ŠKODA AUTO DigiLab serves as an essential instrument and driver of many digital innovation processes. This creative workshop enhances the brand’s development expertise in the field of digitalisation. Working in tandem with the founding branch in Prague, ŠKODA AUTO DigiLab Israel Ltd was launched at the beginning of 2018 in the IT hotspot of Tel Aviv. Both labs are part of the start-up scene; they are agile and think outside the box to develop new business models, solutions and products for the mobility of the future. The think tank in Tel Aviv has built up a strong network in the local start-up scene and is currently working with 13 of the most promising start-ups in the fields of artificial intelligence, big data, cybersecurity and vehicle sensors. In this way, ŠKODA is securing access to new technologies such as big data and artificial intelligence. Three examples illustrate this strategic focus: Anagog specialises in developing and applying artificial intelligence in the context of mobility. The Israeli start-up uses software to analyse customer behaviour in certain situations, understand it and, for example, navigate motorists to the next available parking space. Chakratec is working on electric car charging stations with energy storage devices based on a flywheel concept that offers an almost unlimited number of deep charge and discharge cycles. This will enable charging stations to be installed in remote locations in the future. The founders of UVeye are working on technology in the form of a camera that scans the underbody of a vehicle to detect any damage – which is very useful, for example, in the Production and Quality Control departments. In June 2018, ŠKODA took over management of the INDIA 2.0 project. In this role, ŠKODA is responsible for Volkswagen Group’s model campaign on the Indian market. Volkswagen Group is investing one billion euros in implementing the project, primarily between 2019 and 2021. The funds will mainly be invested in developing ŠKODA AUTO and Volkswagen vehicles tailored to the needs of customers on the subcontinent. The first of these models will be an SUV in the A0 segment that will be unveiled in 2020. The opening of the Technology Centre in Pune in January 2019 was the first major step in the implementation of the project. To ensure maximum market proximity, ŠKODA AUTO will localise 95% of its production, meaning that almost all vehicle components will be made in India. How does the ŠKODA all-wheel drive work off the road?